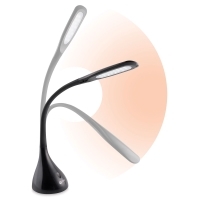 A space-saving lamp with total flexibility, the OttLite Creative Curves LED Desk Lamp bends to position light right where you need it. Its sleek, rubberized flex-neck extends 20" and adjusts in height from 11¼" to 23¾". Illumination comes from super-bright natural daylight LEDs rated to last up to 40,000 hours. 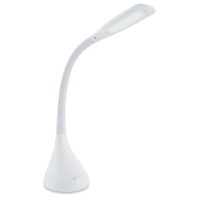 Choose from four brightness settings, which easily adjust by tapping the touch-sensitive control on the lamp's base. LEDs emit a maximum of 375 lumens. A diffuser provides smooth, uniform light. 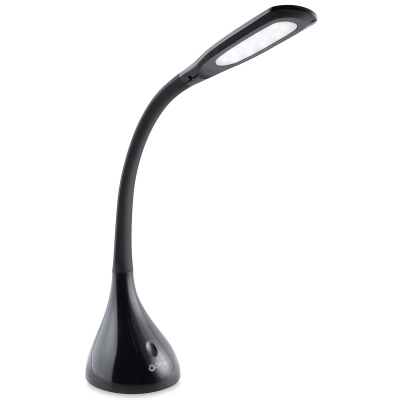 Great for a variety of uses — drawing, crafting, detail work, reading, everyday tasks, and more — the versatile Creative Curves LED Desk Lamp plugs into a standard 120V outlet. Its base is 5¼" (13.3 cm) in diameter.